Well, Chickens, I hope the weird weather where you are is as exciting as the roller coaster we are having here in Chi-town...60 in January??? Mmmm. Global Warming. Hello, tiger. Welcome. Things here are good, weather notwithstanding. Despite a 24 hour stomach bug, UGH, I have managed to finish my new book, Out To Lunch, coming to a retailer near you this December. It is off to my editor, and I am in that blissful brief time when it is actually out of my hands, and I cannot do anything about it till I get my edit notes. Can we say brain vacation? It's another foray into foodie fiction, with more recipes than ever before, and I hope you are going to love it. Charming Suitor and I have been sticking to our commitment to healthier living, he has joined me in my low-carb diet, and we are exercising together regularly, which has been so much better than going it alone. As a part of this plan, Tuesday nights after work we are taking a group tennis lesson. This has required some planning, since after a full day of work and an hour of running around we are both starving and have little desire to cook. And since takeout is a little counter-productive after a workout, Tuesday nights have become either slow-cooker meals, or quick salads. This salad has become a fave, since it is very healthy, very delicious and insanely simple, and goes well with any protein, especially a quick cooking fish or a rotisserie chicken. My local Whole Foods Market has a terrific salad bar that has a variety of cooked grains and legumes in addition to the usual veggies, so for me this is an easy set up. But if yours doesn't, you can use leftover grains or cook some specifically for this salad. Raw cauliflower makes up almost half of the salad, for plenty of crunch and making the grains stretch, perfect for anyone doing low-carb. Plus it is the perfect thing to serve to your veggie or vegan or gluten-free friends. 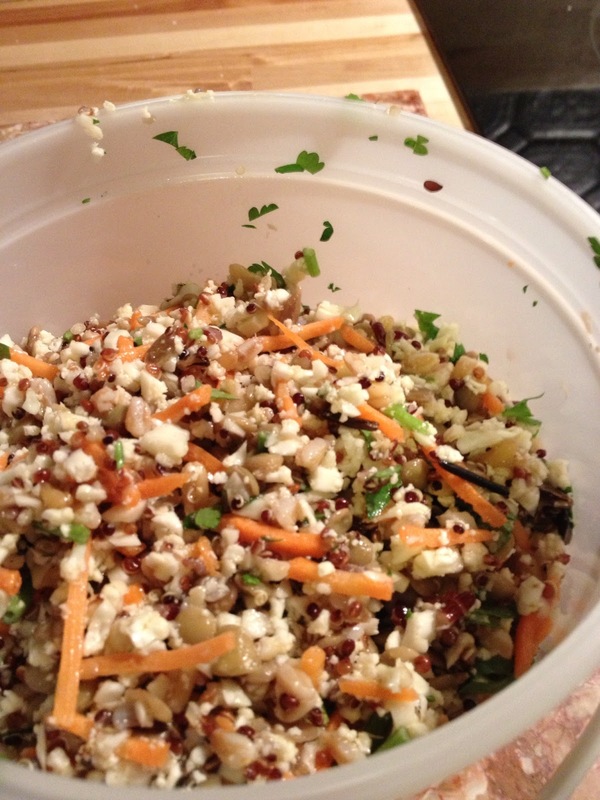 Mix the grains and veggies in a large bowl. Dress with red wine vinegar and olive oil, and season to taste with salt and pepper. What are your go-to quick dishes? Hello Chickens! Is it freezing where you are? Because Chicago is frigid. Luckily, I'm done with my errands for the day, and don't have to go outside again till Charming Suitor gets home and we have to go to the gym. Since we both find this the most onerous hour of our day, we finally figured out that it is, like almost everything else in life, infinitely better when we do it together. Exercise is hateful, but at least when you do it with someone you love, it is manageable. So four days a week we are getting each other motivated to get on those treadmills. We are also taking tennis lessons together, which is even more fun. Not nearly as much fun as buying our first home, however! I have lived in the first floor apartment in this building for 19 years. The moment I first set foot inside, I knew I was home, deeply and profoundly, in the most meaningful way possible. The day I signed the lease, the landlord and I entered into a handshake agreement to give me right of first refusal to purchase the building if he ever decided to sell. In the nearly two decades that have ensued, I have traded up four cars, three beds, two Kitchenaid mixers, and one husband. And many thought I was insane for not just giving up on the dream and investing in a home of my own years and years ago. But despite what most might think, while I am in many ways an instant gratification kind of girl, when it comes to the most important things in my life? I am PATIENT. I know what's worth waiting for. I waited ten years for Charming Suitor, and he was worth every moment, every horrible first date, every lonely Valentine's Day. And this is the cherry on top of our dream, a place to truly call our own. There is something to be said for holding on so that your first house can be your dream house. One of the things that isn't perfect about this place, is that the kitchen is so far away from the living room, it's hard to use your nose in cooking. In other spaces, both CS and I can just smell when the cookies are done, or the cake is ready, or the chicken is perfect. But not here. By the time the scent reaches you in the living room, the cookies are burnt, the cake is dry, the chicken is desiccated. And even when I'm cooking something delicious for dinner, it rarely has that permeating welcome home scent. Except for certain things. 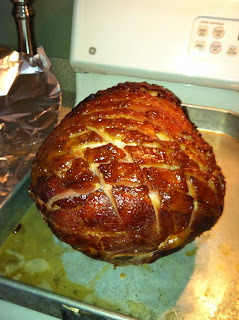 And, we discovered over the holidays that this ham is one of them. I almost never make ham. I love it, but there are only two of us, and hams tend to be large and unwieldy, and don't offer a ton of leftovers options we really like except sandwiches. 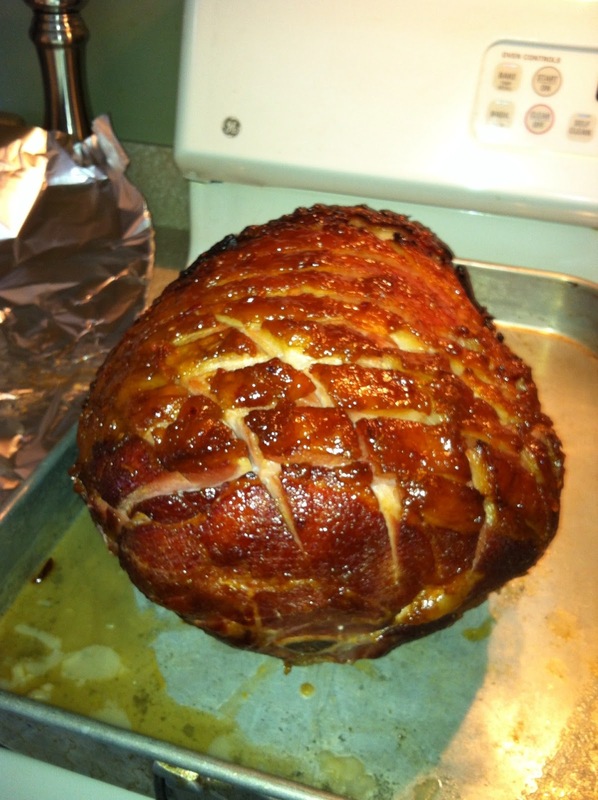 And, with many apologies to my Mom, the ham of my childhood was slorped from a can suspended in icky gel, weirdly shaped like a squashed football, covered in orange marmalade. Somewhat mealy in texture and mostly tasting of salt. Not exactly comfort food. But we look forward to Christmas and Easter for the sheer hamitude. 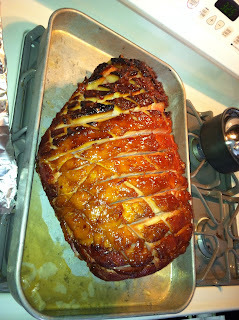 Our wonderful Farmer Paulie, from Paulie's pasture gifted us an enormous ham, from one of his hand-raised hogs. And so we volunteered to bring the ham for Christmas Day with my brother from another mother Officer K and the rest of my adopted extra family. They agreed, and this is the recipe I came up with. It made the whole house smell like happy. Which was perfect, because this is always a happy house. And now, really truly ours. I hope wherever you call home is happy as we start this new year together. Make this ham. It smells like home. Preheat oven to 350. If you are using an unsliced ham, score the skin and fat of the ham in a diamond pattern. Place the ham in a roasting pan, and put 1 c of water in the bottom. Mix all glaze ingredients in a bowl. Spread the glaze all over the ham, being sure to get it into the scores. Cover the pan loosely with foil, trying not to touch the surface of the ham, but still sealing in the edges. Bake for 2 hours. Remove foil and bake an additional half an hour or so to caramelize the glaze. You can hold in a 200 degree oven for up to two more hours before serving. What are the recipes that make your house smell like home? Share in the comments!